Buses remain an indispensable form of public transport. Taking a bus means saving fuel and reducing emissions with every passenger! Buses have become heavier as a result of new active and passive safety elements; however, in the last decade alone, fuel consumption by buses has decreased by 15%. This success is mainly thanks to engineering innovation and efficient lightweight designs. From an ecological perspective as well as one prioritizing climate protection, coaches are the transport of choice. The Federal Environmental Agency calculated that a coach, at an average occupancy rate of 60%, consumes 1.4 litres of diesel per person (p.p.) per 100km, emitting 31g of CO2 p.p. and kilometre. 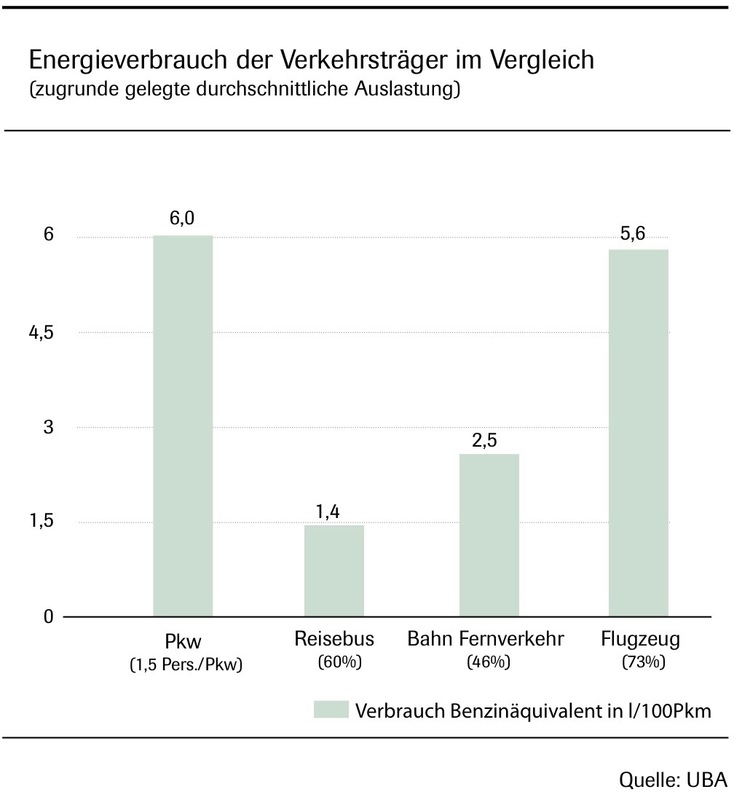 Comparatively, over long-distance journeys, trains emit an average of 46g of CO2 p.p. and kilometre at a diesel consumption rate of 2.5 litres p.p. per 100km. 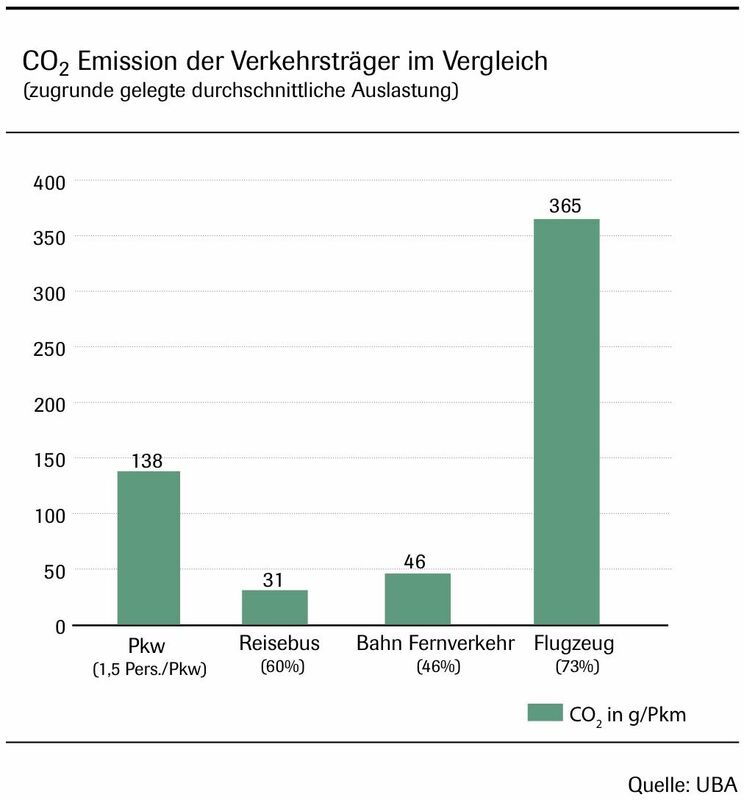 Aeroplanes on the other hand (all other environmental factors taken into consideration), use an average of 365g of CO2 p.p. per kilometre at a diesel consumption rate of 5.6 litres p.p. per 100km. Coaches, therefore, consume the least amount of energy by far and are conclusively the most ecological mode of transport. For passenger travel and from an environmental standpoint, buses are unbeatable and they can contribute enormously to the successful achievement of climate protection targets. The excellent environmental record achieved by coaches is sustained by a fuel-efficient method of driving. German coach manufacturers are aware of this responsibility and provide their customers with regular eco-driving-courses. Using this anticipatory driving style, fuel consumption can be reduced by up to 15%. In an individual bus this would equate to a yearly mileage of 100,000km, fuel savings of around 5,000 litres and ultimately, a reduction in CO2 emissions by approximately of 13 tonnes. Environmental records from over the last ten years show that coaches especially have benefitted from the tremendous progress made in diesel-technology. The combination of sulphur-free diesel, optimised engines, the innovative after-treatment of exhaust gases, as well as regular driver-training courses has turned the modern diesel powered coach into a ‘Near-Zero-Emission vehicle’.